Manlius High School "Red Devils"
The peaceful village of Manlius and its 375 residents sits approximately 1/2 mile east of Il. Rt. 40 and 4 miles north of Interstate 80. 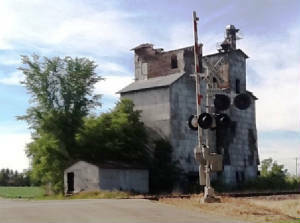 This is approximately 12 miles northwest of the Bureau County seat of Princeton. The Manlius school system was started in 1913. That year the people coerced a student from Buda High School to tranfer to Manlius High School so they could honor a graduating "class" in their first year of existence. Therefore Laura Rennick serves the distinction of being the first graduate of Manlius High. The Manlius school system also took students from the nearby village of New Bedford (population 100) and produced some incredibly talented and successful athletic teams over the many years it was in existence which will be highlighted furhter on down the page. In the early 1990s the high schools of Manlius, Walnut, Wyanet, and Buda-Sheffield Western all researched the possibility of consolidating into one school district. This consolidation effort became a reality in 1995 as the four schools make up what is now known as Bureau Valley High School. A new school building was built on Il.Rt. 40 just west of Manlius. School fight song: "We're Loyal To You Manlius"
We're loyal to you Manlius High. We're red and we're black, Manlius High. For we know you have sand, Manlius High. So crack out the ball, Manlius High. We're backing you all, Manlius High. Victory from you Manlius High! Dear Alma Mater, Manlius High! The Red Devil athletes were known throughout the years for their competitive nature. The Manlius "Red Devils" were known as the "Maroons" until a nickname change occurred in 1940 to the "Red Devils". For more information on the Blackhawk Conference check out John Ballentine's article on the GREAT CONFERENCES page of this site. ), and then Indian Valley Conferences (through its closure), as well as many years ran concurrently in the Bureau Valley Conference, MHS brought many conference championships as well as some IHSA District and Regional hardware. The basketball team competed for many years in the then infamous Bollman Fieldhouse in New Bedford. At one time this gym was THE premier gym in the area, playing host to several Conference tournaments as well as several District and Regional tournaments. 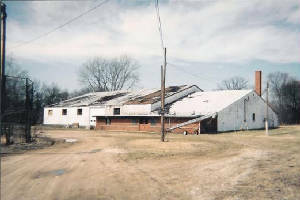 The gym building still stands, now used in a private capacity. 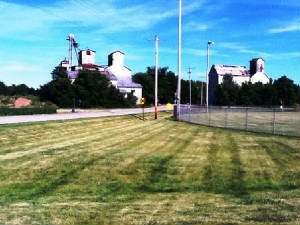 Next to the Bollman Fieldhouse is an older, now unused baseball diamond. It is believed that Red Devil Baseball teams once played there (A side note is that New Bedford hosted a couple of national Softball tournaments in the 1930's and 1940's). The more successful teams according the IHSA web site (www.ihsa.org) are listed below. Bill Rudiger - Was one of the leaders of the Manlius teams of the early 1950s. There are very limited resources on the IHSA website regarding Manlius Red Devil football. One name speaks VOLUMES for the football program. Coach Ken Bourquin coached the Red Devil program from 1959 - 1994. He is listed as one of the top all-time winningest football coaches in IHSA history (164 wins). There were also many great seasons in the 40s and 50s which have been researched but whose information is unavailable. It is known some of those teams were inducted to the Bureau County Sports Hall of Fame in the 2001. If you have information regarding these or any other Red Devil teams that were conference champs or had only 1 or no losses please drop us a line. An update regarding teams of 1969 - 72 was sent to us by Duane "Hayhook" Blackert. The Red Devils had three undefeated seasons of conference championships (1969,'70, and '72) sandwiched around a fourth season in 1971 in which the Red Devils went a not to shabby 7 - 1 - 1. The Red Devils were led by legendary Coach Ken Bourquin who was assisted by local legend Coach Joe Ricci. "Hayhook" advises that in 1969 a total of 55 out of the 65 eligible boys in Manlius HS were members of the football program. The 1969 Red Devils were led by halfback Ed Potter. The 1970 squad was led by halfback Butch Harp, and the 1972 squad was led by halfback Dennis Hartz and quarterback Joe DeBrock. "Hayhook" thanks Coach Ricci for giving him the nickname because of his ability to use his large wingspand at his defensive end position to contain the opposing team's sweeps. Two other items regarding the Manlius HS football program include that the team co-oped with Tampico HS from 1989-1994 and enjoyed great success as well. Also there was one particular game in 1991 which is still marked as the second longest game in IHSA football history. Playing the Annawan Braves the Manlius/Tampico boys came out with a 5 Overtime victory winning 7 - 6! What a game that must have been. The seasons written about on the IHSA web site are listed below. More history and seasonal records below are provided by John Roberts, avid Manlius High School fan! -1920 *Manlius had it’s first football season this year. -1923 *Manlius didn’t play Rock Falls that year in football, but they did beat Neponset 71-7 in a non-conference game, and they played an alumni game with people from the town which they beat 26-0 that year. Manlius also outscored their oponents a total of 373-27. Coach Lewis E. Perry. 1924 *Manlius won “Little 6” conference with 3-0 record. Ohio and Sheffield weren’t counted in this year, no explaination is given. Their two losses this year came 12-0 to Rock Falls, and 27-7 to Princeton, as well as wins this year like a 22-21 win over Bradford, 6-0 win over Neponset, and they outscored all opponents 227-66. Coach L.D. Anderson. 1925 * Coach L.D. Anderson. 1926 *This year still had Bureau Township High School playing Manlius as they defeated MTHS 60-0. BTHS also won the “Little Six” conference Championship that year. Coach S. Fred Calhoun. 1927 * Coach T.L. Traughber. Beat Buda 24-0 after losing to Buda 37-0 earlier in the season, and after a (2-5) start on the season. 1928 * Coach T.L. Traughber. Third in “Little 6”, after playing tie games with Champs Walnut, and 2nd place team Buda. 1930 *Coach Thomas L.. Traughber. Tied for second in “Little 8” with record of (5-1-1). 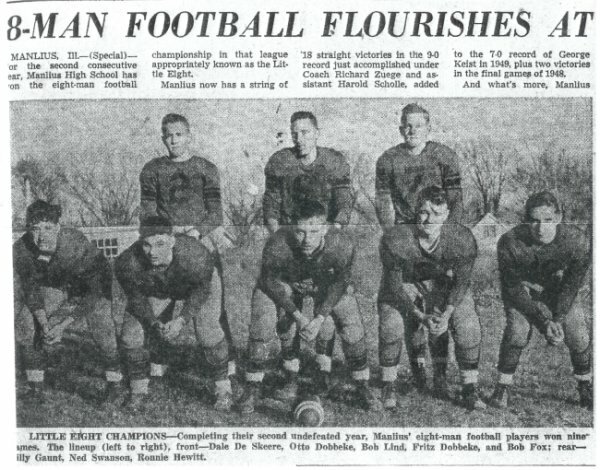 -1935 *Played four games in the “Little 6”, with a record of 2-2 including a 2-0 forfeit to Walnut. Finished (2-3-1). Coach Chester Shermann. 1936 *First year of playing 8-man football in now “Little Eight” conference. Tied Manlius alumni team, and lost to Conference Champion, Wyanet. Second in conference. Coach George Taylor. 1938 *Coach George Taylor. (3-4-1), (1-3-1) in “Little 8”. *First year of “Little 8” traveling trophy for all boys’ sports. First team to win it 3-in-a row keeps it for good. Outscored opponents 311 - 13! Outscored Opponents 353 - 37! 1948 4 - 3 Outscored Opponents 193 - 98! Outscored Opponents 262 - 57! Outscored opponenets 452 - 54!!! Outscored opponents 458 - 56!!! 1958 *First year of entering the. Coach Les Conklin. Red Devil program in 1964. Annawan went to Final 4 Rd. One male athlete at Manlius High School brought home two medals from the IHSA state track meet. In 1924, Manlius won the Sterling H.S. Invitational. Others who qualified for state are also listed. The Lady Red Devils were not to be outdone. The only information we have available is the years in which the girl's basketball teams won their 5 Regional titles. If you have the season records and coach's name(s) please drop us an e-mail. The girls volleyball team also brought home some IHSA hardware. More information is needed regarding this team as well as any other good MHS Lady Red Devil volleyball teams. One interesting fact is that the first season at MHS lasted from September to January with only 11 games being played.
" 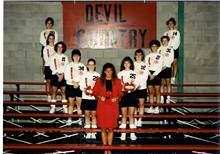 We (1992-93 team) were the first team at Manlius to win the regional in volleyball, and it was all Manlius girls. I was a sophomore that year, and I played along with 2 other sophomores, 1 freshman, and a couple of juniors as there were not a lot of upperclassmen who went out, hence the co-op the following year." The following information was provided by avid Manlius fan and alumnus Dave Oloffson regarding the Lady Red Devil track program. While it is not known if Manlius ever had a Girls Bowling team after Title IX, there were teams before then that competed in IHSA Postal Tournaments (as they were later called). 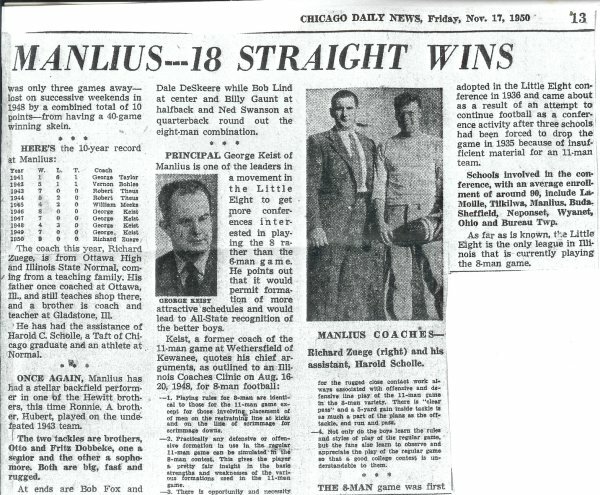 In 1965, Manlius placed in second in the tournament. The Red Devils played baseball at Bollman Field, located about 100 feet from Bollman Field House in New Bedford. The field was set up for men's fastpitch softball, so the homerun fence was relatively short allowing for some great games. 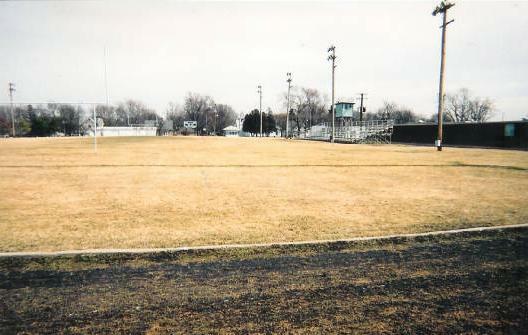 The sport was discontinued at the high school in 1975. 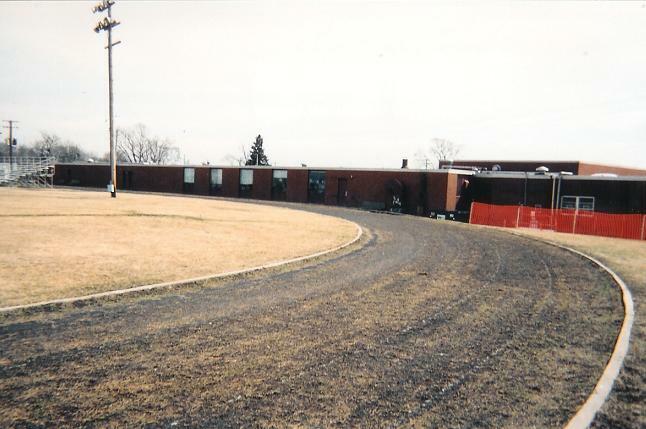 The baseball teams used the New Bedford field starting in the late 1950's through at least the 1960's. For small schools such as Manlius, placing in IHSA activity events were tough to do because of bigger school competetion. However, in 1974 and 1975, Manlius students Debbie Morgan and Steve Oloffson were represented in the top five in their respective events. In 1974, Morgan took fifth place in Humorous Interpretation and in 1975 she teamed with Oloffson to take fourth in Humorous Duet Acting. In football the name Ken Bourquin is closely tied with Manlius as well as Illinois High School lore. Mr. Bourquin went an incredible 164 - 141 in the 30+ years he coached at Manlius High School. In boy's basketball Coach William Jenkins won 3 District titles and had a record of 138 - 61 during his 9 seasons at the school (1956-1965). He moved on to Polo and amassed a career total of 297-162 from 1956 to 1976. Jenkins is an inductee in the Illinois Basketball Coaches Association Hall of Fame and still coaches lower levels at Polo.